- 66 - 75 - 80 - 82,5 - 85 - 87,5 - 90 - 92,5 - 95) I scored it 90. My notes state a very fine sherry profile that demands a fair share of water to open up. 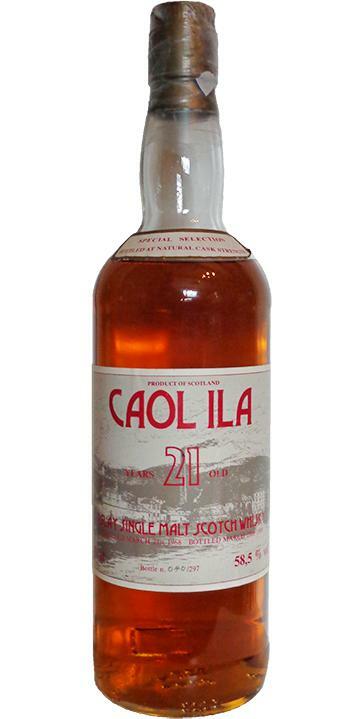 After that it offers the typical smoked bacon flavour of old Caol Ila. Nose: less immediate than the 1968 Samaroli, it offers a beautiful fine peat, then exotic fruits very or even too ripe, first in the background then very marked, bitter almonds (orgeat), all perfectly melted by the OBE. Superb complexity. With aeration, he develops a medicinal and mineral side, with betadine, aspirin, something of limestone. Mouth: De Zeus !! We find the complexity of the nose, served by a greasy, oily texture that lines the palate. No aggressiveness, the 58.5% pass alone. Awesome! The exotic sweetness is there, the syrup orgeat too, but the peat powerful (more than the nose) avoids any feeling of disgust, and even covers a little fruit. Coal smoke and aspirin. Final: Long, but less than that of Samaroli, on peat, licorice, coal smoke. Fewer fruits here. Tasted in parallel with the 1968 Samaroli and the 1974 C # 5-9 Signatory Vintage. 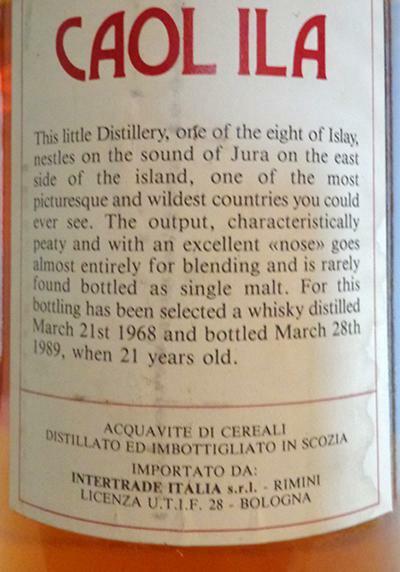 (mythical bottling, the distillery having been rebuilt between 1972 and 1974) Gold color, the nose needs opening, a little glue at the beginning then a very fine peat and exotic fruits (but less than in mouth), a little OBE, a medicinal, mineral, iodized and farmer side. Powerful mouth, well integrated alcohol, very beautiful peat, lemony, oily, oily, greedy, with yellow fruits and ripe exotic fruits, almond, some camphor and spices. Very good length, a little less fruit on the end.